Featured today is a fully natural, unheated Mozambique Ruby of 1.37 carats set in 22-karat gold as a Sun talisman ruby ring. The gemstone is a mixed cut oval with a vivid reddish pink color. There is palpable fire in the belly of the gem and the ruby is quite lustrous. The book Tavernier’s Travels in India lists descriptions of some magnificent rubies, especially of two exceptional ones with the ruler of Ceylon – “Among these he hath two rubies, of which he weareth one hung around his neck, and the other on his hand wherewith he wipeth his lips and his beard; and each is of greater length than his breadth of four fingers and when held in the hand it standeth out visibly in either side to the breadth of a finger. 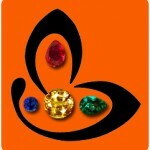 I do not believe that the universal world hath two stones like them.” Such rubies can only be imagined today. 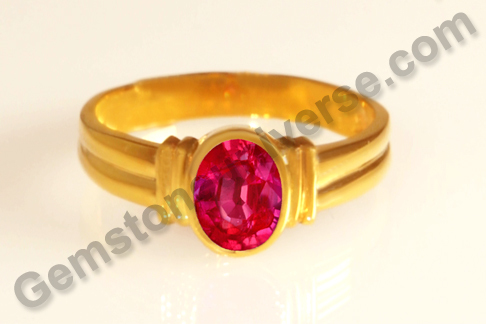 According to Vedic astrology, Natural ruby or manik stone is the gemstone of the planet Sun / Surya and is used to harness the saatvik energies of the King of the Zodiac.